Amiga Engineering Pty Ltd manufactures Tee’s and Eccentric Tee’s in “Block Style”. Tee’s can be manufactured in a variety of dimensions and shapes – as per client request. These 3 way pipe fittings are called “Tee” because they are generally shaped like the letter “T”. The shape of the T provides 2 horizontal pipes and one vertical pipe to attach – they are cut at 90 degrees to the main line. Tee’s manage the mixture of fluids and can help manage the direction. Equal Tee’s have all the outlets at the same size and are also known as “Straight Tees”. The reducing Tee have a combination of different outlet sizes. 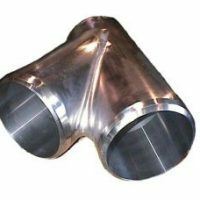 They are mainly used as pipe fittings or tube fittings and are essential because of the two purposes they provide. A Tee is used to combine or split a fluid flow. 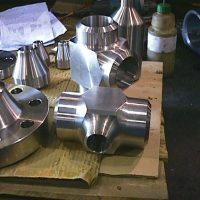 You will find Amiga Engineering’s Equal Tee or Reducing Tee on almost every oil rig or pipeline across Australia. 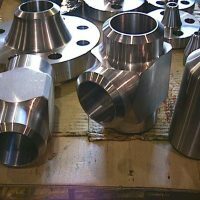 Tees are widely used in various industrial and commercial applications. Some industrial applications that might interest you are: Petroleum, pulp/paper processing, chemical processing, Waste treatment, marine, industrial equipment, gas compression and many more. If you want or need high quality Reducing Tee’s or Equal Tee’s, then call +61 03 9330 0688 or e-mail sales@amigaeng.com.au for a free quote. Amiga Reducing Tee’s and Equal Tee’s are proudly Australian Made from Australian Material (unless specified).